Stockton Town have again been filling up local paper column inches following their remarkably successful “014/15 Season, when the following article featured in Mike Amos’s Backtrack column on Thursday 11th June. “ON Friday evening to the Wearside League’s annual dinner, with which unofficially was combined Stockton Town FC’s presentation night. The menu card listed eight awards. All but the admin award, efficiently won by a gentleman called Golden from Sunderland West End FC, were lifted by Stockton. 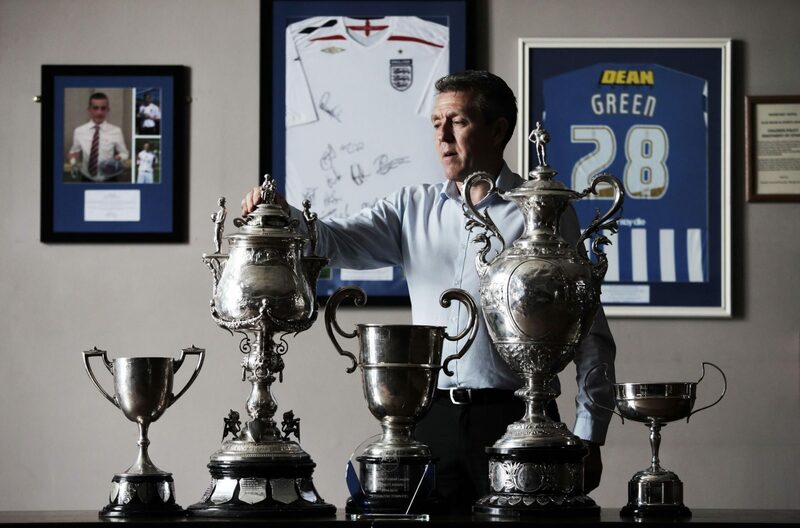 They were the league, the league cup, the Sunderland Shipowners’ Cup and the Monkwearmouth Charity Cup. Kallum Hannah, 56 in 43 games, won the scoring award while goalkeeper Michael Arthur, just 17 conceded in 34 games, took the “safe hands” award. The major trophies, it should be said, are not the usual EPNS-ities. Rather they are magnificent examples of the Victorian craftsman’s art, if not worth their weight in gold then certainly in solid silver.